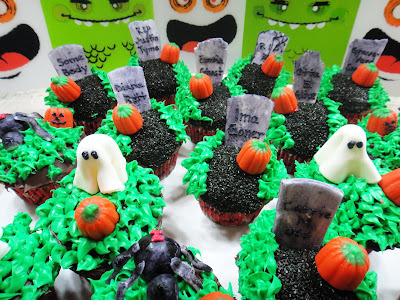 I'll be delivering these to a 2nd grade class today for their Halloween Classroom Party. Halloween Cupcakes with Fondant Ghosts, Tombstones and Spiders. Bake your cupcakes and get ready to decorate! 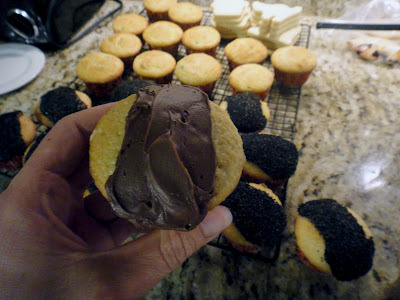 First, spread a stripe of chocolate frosting down the middle of your cupcake. 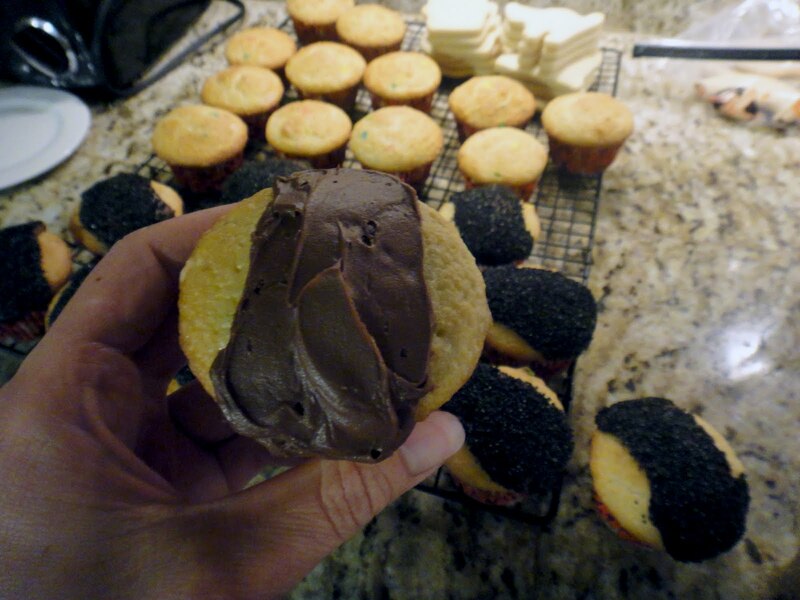 Pour some black sugar on a plate and then dip the cupcake in the sugar. 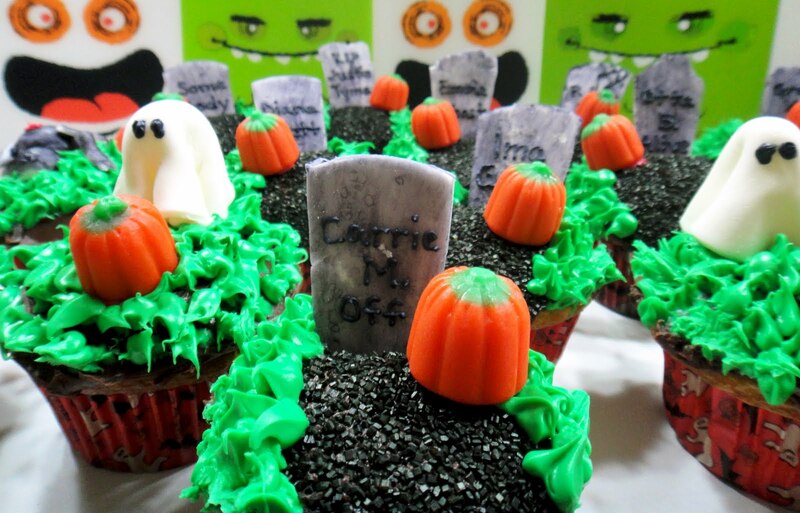 The sugar only sticks to the frosted part- so don't frost the entire cupcake unless you want the sugar on the entire cupcake. Then, pipe grass on the exposed cupcake as shown below. I use ziplock bags with the corner snipped for all of my piping. Place the marshmallows and water in a microwave safe bowl and heat for 30 seconds. Stir and heat another 30 seconds or until melted. Pour powdered sugar into greased mixing bowl- greasing the mixing paddle as well- melted marshmallow is sticky! Mix to form a dough and then empty mixture onto a kneading surface to knead until the surface of the fondant is nice and smooth and pliable. You may want to keep adding a little Crisco to your hands. If it is dry and crumbling while kneading, just add more water. When you are ready to roll out your fondant, sprinkle your surface with a little powdered sugar like you would flour when rolling out cookie dough. 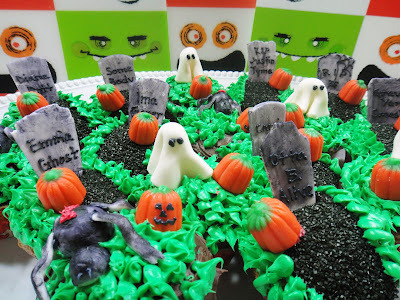 You can use a round cookie cutter to make the fondant ghosts. The top of the french press was the perfect ball size to shape the ghosts, but look for other things around the kitchen or your house. A Dum-dum sucker would work, too! Just drape the circle over the ball and mold to the ball- sort of gathering the bottom to make the draping of the ghost. 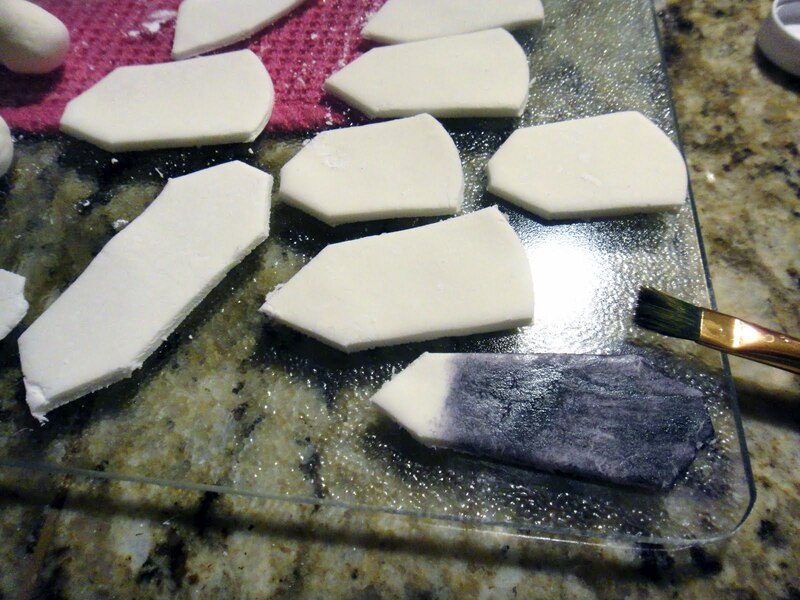 Remove from molding piece and they should stand on their own. Be careful not to stretch the fondant too much or it will tear. 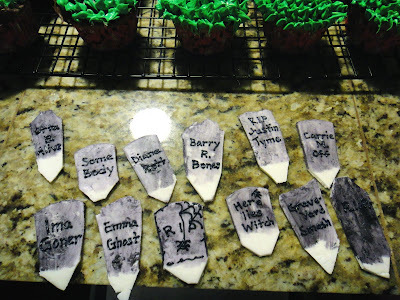 I free handed the shapes of headstones withe a knife. Rather than mixing color into the fondant, I brushed food coloring on with a brush and a little water to get a varied look. 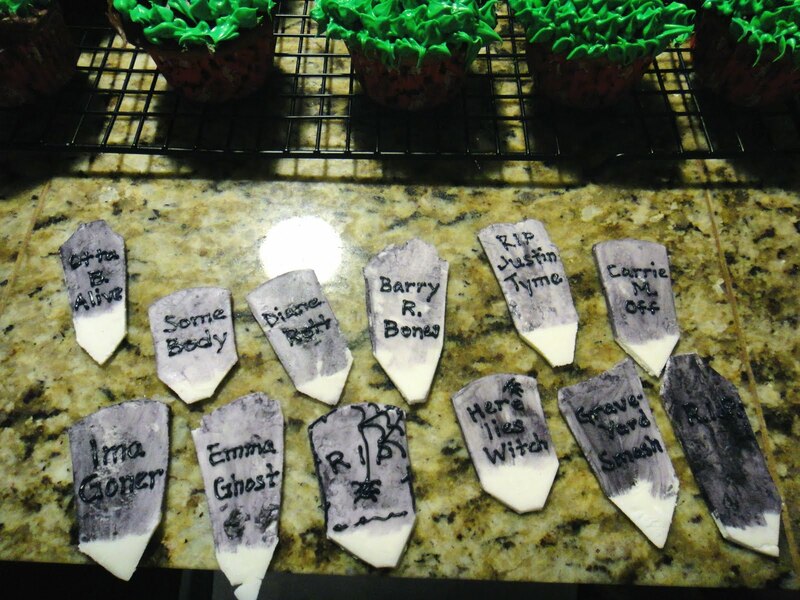 Next, pipe names on the tombstones. Here are a few examples: Ima Goner, Otta B Alive, Barry R Bones, Justin Tyme, Carrie M Off, Diane Rott, Emma Ghost, Some Body, RIP, etc. 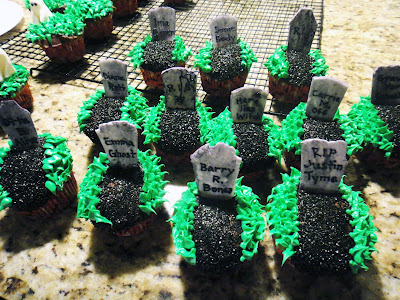 Cut the fondant at a point at the bottom of the tombstones to make it easier to insert into to cupcakes. 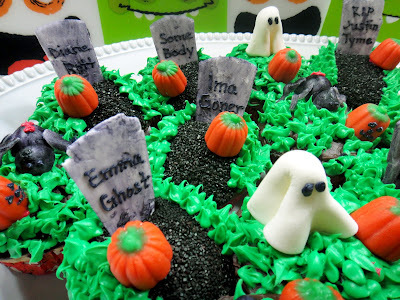 Then, place the ghosts and spiders and pumpkins with a dab of frosting on the undersides. 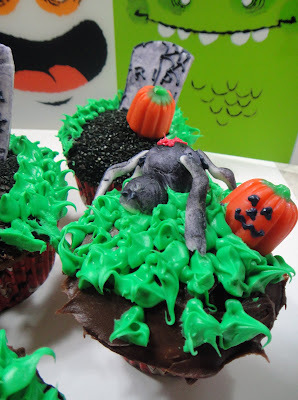 The spiders are made of fondant as well. 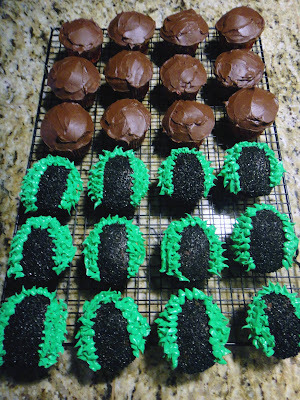 The body and head are formed balls, and the legs were rolled in my hand and shaped to attach with a dab of frosting. I hand painted with black food coloring, as well, and then piped fangs and the red hourglass on the back of the spider to make it a black widow spider. 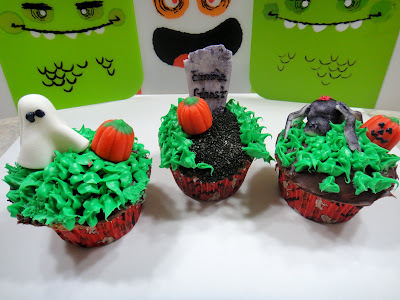 I bought the Brachs "Autumn Mix" candy corn candies for the pumpkins, but you can also make your own from fondant. I piped jack-o-lantern faces on the pumpkins with the spiders for an extra detail.